I have to be honest: I don’t feel like writing tonight. At all. Today’s events in Boston have shaken me up. I’m sad for Boston, for the families directly affected, and for the world. I’m about to spend the next 7 days on the road. In planes. In major North American cities. I’m going to see friends, clients, and colleagues, people that inspire me and make me better. Friends that I don’t get to see very often that I miss desperately. I’m still excited about all of these wonderful opportunities despite my unease. So tomorrow I’ll remember what Fred Rogers taught me when I was little. I’ll be kind. I’ll be patient. 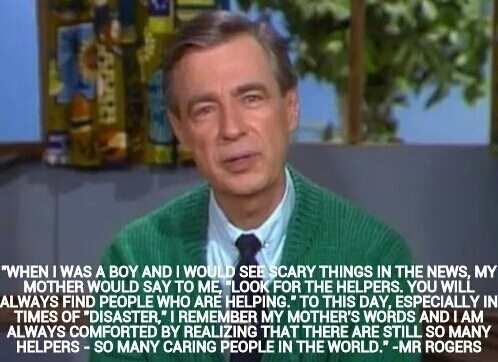 And while I’ll look for the helpers, I’ll be a helper too and spread a little love when it’s clear that the world needs it most. Hug your dear ones a little tighter tonight and send light and love Boston’s way. This entry was posted in So and tagged Boston, Fred Rogers, Julie Petroski, kindness, love, travel. Bookmark the permalink. Travel safe. See you Thursday! I sure hope so, Fransi! Great post Julie. Have a safe journey. Thanks, Linda. I appreciate that you read my posts. Take care on your travels, our thoughts and prayers are with America and the peoples worldwide who are suffering from the ravages of those who continue to inflict pain on the innocent. Thank you. This is not a fun travel day, btw. Looks like American Airlines is experiencing a system-wide computer issue that is impacting U.S. airports as well as Toronto. The earliest they said we’d fly is 4 pm CDT.